KDevelop4 UI: Areas, Working Sets, etc. 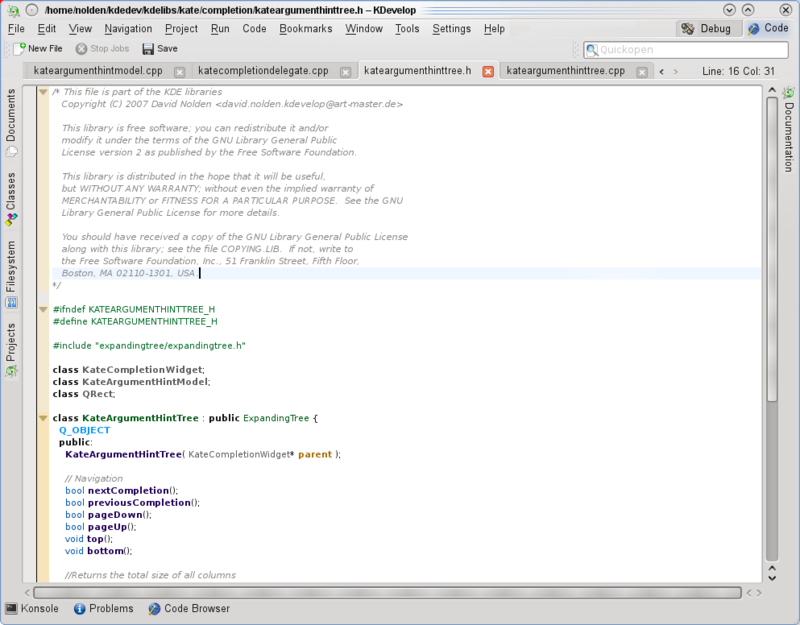 A lot is happening in KDevelop4 these days. Now it’s nearly already 2 Months ago that we had our developer meeting in Ukraine. We had a lot of fun, although for me the trip started two days late. I didn’t get my passport in time, damn. But once there, I got quite productive. Since I have limited time these days, that hack sprint motivated me to touch the one big outstanding architectural issue yet existent in the duchain. I knew it was a painful mammooth task, that’s why I kept my fingers off it for a long time. I have implemented a special reference-counting mechanism for the duchain that uses the standard convenient C++ way of achieving the thing: In the constructor of an object, increase a counter, and in the destructor of an object, decrease it again. Now finally _everything_ in the duchain is reference-counted, even extreme light-weight objects like “IndexedString”, which is nothing more than a wrapper around an integer representing a string. That object is used everywhere, and since the reference-counts are disk-persistent, increasing them is not as cheap as usually. So here’s the clue: It is only done when the memory-area the constructed/destructed object is in is actually marked as a “disk persistent” area, that will be stored to disk later, or is already on-disk. That means that it has near-zero runtime overhead for most of the object usages. During shutdown the objects are all sweeped, and the ones without a persistent reference-count are cleared away. The most complicated task was getting all the already existing duchain storage schemes work nicely together with such reference-counted containted objects. Apart from this architectural thing, the focus is mainly on polishing now. Tons and tons of bugs and crashes were fixed. Apart from bug-fixing, I’m trying to use my limited time to move KDevelop4 forward in some of the other areas that need it most. After all, a good C++ support alone is not enough of a selling point for an IDE, and I have some ideas about how KDevelop 4.0 should look. Also, I sometimes feel the intense need to do something “creative”. Now KDevelop4 has a feature called “Areas”. From what I know it’s comparable to the Eclipse “Perspectives” feature with some slight differences. Each area contains a distinct set of tool-views, and toolbars, tailored for a specific task (Currently we have “Test”, “Debug”, and “Code”). In difference to Eclipe Perspectives, areas may also contain different sets of files. We actually thought about renaming them to “Perspective” for consistency, but then again “Perspective” implies looking at the same thing just from a different direction, while an “Area” is actually a different working-space, like a different table, where you use different tools to work on different items. So we’ll probably stick with this terminology for now. Before the hack sprint, there was a little dropdown list in the toolbar to switch areas. But in our opinion this was not very usable, given that we want areas to be a central part of our UI concept. You could never see what other areas there was, and you always needed one click too much to switch them. So we discussed different mechanisms for area-switching. My initial idea was quite simple: Use tabs. It’s the concept that fits best. Just some additional non-removable tabs somewhere at the top, and areas would be totally intuitive and logical to use. The others were a bit more in favor of using separate toolbuttons, and after I wasted a few hours trying to hack something together with tabs, I gave it up. Alexander Dymo then created area-switcher toolbuttons, probably similar to the way Eclipse does perspective switching. Just by the way you may be wondering why there suddenly is so few wasted space: On the hack sprint, Alexander Dymo removed both status-bars, moved the editor-information(line+column) into the file-tab line, and moved status indication in the bottom toolbar into the bottom dock switcher, so both status bars are gone. If you’re wondering about the additional highlighting of the current area tab: We were a bit worried that tabs in the top-right would be somewhat out of user focus, the user might not notice when the area automatically changes, and that it might also be a bit confusing having multiple levels of tabs in the same user-interface. The highlighting moves the thing more into the user focus so changes are directly recognized, increases general awareness, and makes it generally look like a different widget then the document tabs, which reduces confusion. Now after all the mocking, which I actually just did to start some discussion and gather some ideas+opinions, I suddenly found the hidden QMenuBar::setCornerWidget function, which actually allows implementing the last mockup in a relatively clean way. I sat down for an evening, and ended up with exactly what you see on the last mockup. It needed some additional hacking to get the added highlighting, to have the icons on the left side while having a general right-to-left layout, and to make the tab separator line fade out to the left, but it works, and it is solid. And at least my personal experience shows, that this is very usable and very intuitive, while not wasting a single pixel. A few years ago, shortly after I joined the KDevelop project, there was a lengthy discussion about tabs in general, and whether/how they could be made useful. The problem: From a specific count of documents upwards, tabs are completely useless to get an overview. And due to the easy navigation in KDevelop, it easily happened (and still happens) that suddenly 20 documents were open, making tabs completely useless. At the beginning of KDevelop4, some developers were tired of the uselessness of tabs, and completely removed them in favor of a dropdown list. However me and some others couldn’t live with that. The problem: You replace something that sometimes becomes useless with something that is always useless. There has always also been a document list toolview, that shows all currently open documents. Those who don’t want tabs probably use that. However, as I know from using kate, even a document-list becomes nearly useless from a specific count of documents on. So at that time, I had the idea that instead of trying to create an utopic widget that allows easily managing an infinite amount of open documents, just allowing the user better ways of managing the set of documents he is currently working on, so he can easily keep the count of open documents in a tab-manageable area. My idea of achieving this at that point was using working sets. A working set is a specific set of files, the files you really work on. For me, when the open document-count grows into an unmanageable area, that usually comes from either working on multiple problems at the same time, or from a lot of browsing through different documents. The core development activity is usually only focused on a relatively small set of documents. A working set allows grouping small lists of documents together, archiving and restoring them, easily merging, splitting, duplicating, and easy moving of files from one working-set into the other. Such a mechanism would allow keeping the count of files manageable: As soon as you start working on another task, just close the whole current working set, and start your new task with a clean list of documents. As soon as you want back one of the old files or the old working-set, just restore it. Paired with a good user-interface, this might well create a new and more efficient paradigm of working. My idea was that each working-set would be represented by a unique icon somewhere in a permanently visible part of the UI, so you can easily access them. – Areas have different sets of documents, so if they should be really easily usable, it should also be easy to transfer files from one area into the other. – Due to the area-tabbar I have added, there suddenly is a perfect place where those working-sets could live: At the left side of it. – KDevelop4 also supports multiple main-windows. How to synchronize or move documents between them? Working-sets would make it a breeze. Combined with the advantages above, this just created too much temptation for me not to try it. 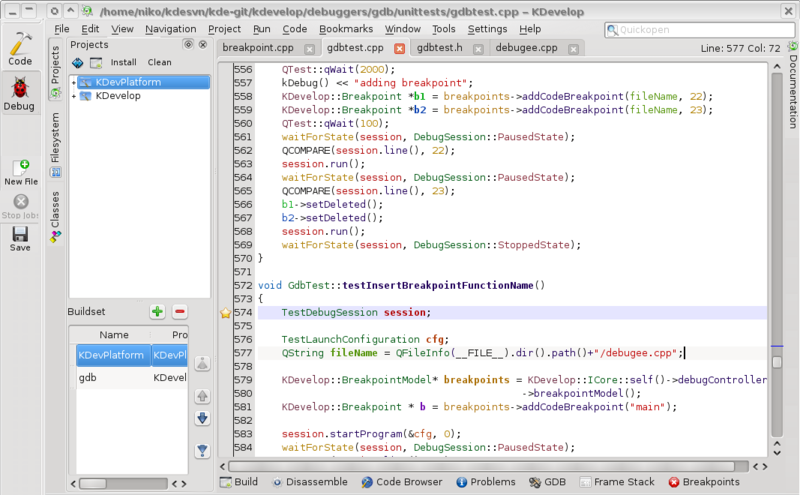 So within the last weeks I piece by piece created full working-set support in KDevelop4. The hardest part was adapting the background management part of KDevelop4’s UI framework, and until a few days ago it suffered from frequent crashes. But now it seems to finally be stable, so I can announce it for you to try out. At the left side of the area-switcher, you see the icons for all existing working-sets. Currently that is only two. The icons are taken from several other KDE Applications. In long term, we need a unique set of icons that are totally association-free in the software world for usage in the working-sets. But for now, the most important thing is that each set has a different icon. The area-switcher itself shows the currently active working-set within the switcher, so you see which working set is active in which area. Also there’s an additional working set icon left to the document tabs, to make clear that they belong to each other, and make it yet a bit clearer and easier to use. When you click onto one of those icons, the clicked working set is loaded into the current area, or it is closed if it is the current set, allowing you to create a new one by opening a new document. When you hover a working set icon, you get a very useful tooltip, showing you the contained documents, allowing you to load or unload single documents with one click, and to delete or close the entire working set. This is how it looks when you’re in the debug area, with a different working set open than in the code area. Working-sets are fully synchronized, so if you activate the same working-set within both areas, the areas transform into Eclipse perspectives, as they both always contain the same documents. On Monday KDevelop4 will go into a mini-freeze with only bugfixes allowed, before releasing the next beta middle of the week. We want to make sure to release a high-quality and stable beta. We have released beta3 just a week ago, but that was a bit premature, as it doesn’t contain some features that we want feedback about, and there were quite a few important last-minute bug-fixes that we would have liked to add, but the release process was already a bit too far at that point.